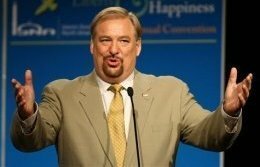 Apprising Ministries is pleased to remind you that in his article The Gospel According to Warren a few years ago Dr. Gary Gilley tells us that Purpose Driven Pope Rick Warren, of the highly influential Saddleback Church, best “exemplified the market-driven approach” to church growth. God accepts us unconditionally, and in his view we are all precious and priceless. Focus on this and you will not waste any time and effort trying to be someone you’re not. Discover, accept and enjoy our unique “shape” [which refers to Warren’s S.H.A.P.E. program] ….Be content with them [our weaknesses]. God doesn’t expect perfection but He does insist on honesty. When I honestly admit my errors and ask forgiveness in faith, He doesn’t hold a grudge, doesn’t get even, and doesn’t bring it up again. We should practice such a forgiving attitude with ourselves. Start affirming the truth about yourself! The truth is God has created you with talents, abilities, personality and background in a combination that is uniquely you. It’s your choice. You can believe what others say about you, or you can believe in yourself as God does, who says you are truly acceptable, lovable, valuable and capable. Now, doesn’t page 17 of The Purpose Driven Life say, “It’s not about you?” Indeed, that’s precisely what it says; in fact, it’s a critical component to the the man-pleasing musings of Rick Warren, which to my eye anyway, read almost identically to the man-loving message of Robert Schuller. If only we could love ourselves enough to dare to approach God, what constructive dreams he would give us! What noble possibilities God wants to reveal to us–possibilities that would offer stimulation plus real security in service. But we feel too unworthy. So one layer of negative behavior is laid upon another until we emerge as rebellious sinners. But our rebellion is a reaction, not our nature. By nature we are fearful, not bad. Original sin is not a mean streak; it is a nontrusting inclination. The core of original sin, then is LOT—Lack of Trust. Or, it could be considered an innate inability to adequately value ourselves. Label it a “negative self-image,” but do not say that the central core of the human soul is wickedness. If this were so, then truly, the human being is totally depraved. But positive Christianity does not hold to human depravity, but to human inability. One might legitimately ask why Dr. Schuller believes classical theology errs so gravely. His answer: Luther and Calvin were listening to the wrong person! He asks the following rhetorical question: “Luther and Calvin, we know, looked to the Book of Romans in the Bible for their primary inspiration. Were they, unknowingly, possessed more by the spirit of St. Paul than by the Spirit of Jesus Christ? Are we not on safer grounds if we look to our Lord’s words to launch our reformation?”  The implication is that what Jesus said in the gospels overrides everything else in the Bible. No one has exemplified the market-driven approach better than Rick Warren, pastor of the huge Saddleback Church in southern California and author of The Purpose-Driven Church and The Purpose-Driven Life. While Warren is open and up-front about his philosophy, strategy and methods, nevertheless things are not always as they appear. He belittles pop-psychology then repeatedly promotes it by simply calling it something else. He publicly cuts ties with Robert Schuller, then regurgitates some of the most odious things that Schuller has been teaching for thirty years. He claims commitment to the Scriptures then undermines them at almost every turn. He will tell his followers that he is not tampering with the message but only reengineering the methods, when in fact he has so altered the message as to make it all but unrecognizable. And so, I ask again: Why is it that Dr. John Piper feels such a need to promote Rick Warren right now? Robert Schuller, Self–Esteem: The New Reformation [Waco: Word Books, 1982], 66, 67, emphasis mine.